PONTELAND’S fabulous flowers finally struck gold in a regional competition. The town council-led team has won silver gilt certificates in the previous three Northumbria in Blooms, but this year it has gone one better. The gold award was given to Joyce Butcher, Chairman of the authority’s Northumbria In Bloom Working Party, at the ceremony in Spennymoor Leisure Centre. Ponteland’s special category entries also did very well as Cecil Court achieved gold in the Residential Community section and Ponteland Bowling and Tennis Club won the top award in the William Leech category. The Diamond Inn received a silver gilt in the Whitley Bay Guardian Trophy. 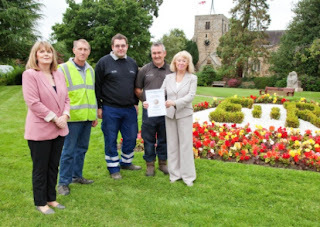 Town council Clerk Kath Mavin said: “The council would like to thank all those who helped make this award possible, in particular our contractors Iain Clough, Michael Champion and Derek Sherlock. “Appreciation is due to Northumberland County Council and the members of the Neighbourhood Environmental Team who make such a difference in Ponteland and of course the Northumbria in Bloom Working Party deserve thanks for their sterling efforts which have paid off. Ponteland has two entries in the Britain in Bloom – It’s Your Neighbourhood awards. They are Athol House and Friends of Ponteland Park. Presentations will take place on Thursday, October 25, at Spennymoor Town Hall.